Leaving skin on, prick potatoes both sides with a fork and place in microwave on High for 7 minutes. At 4 minutes, turn potato over and cook for remaining 3 minutes on High. 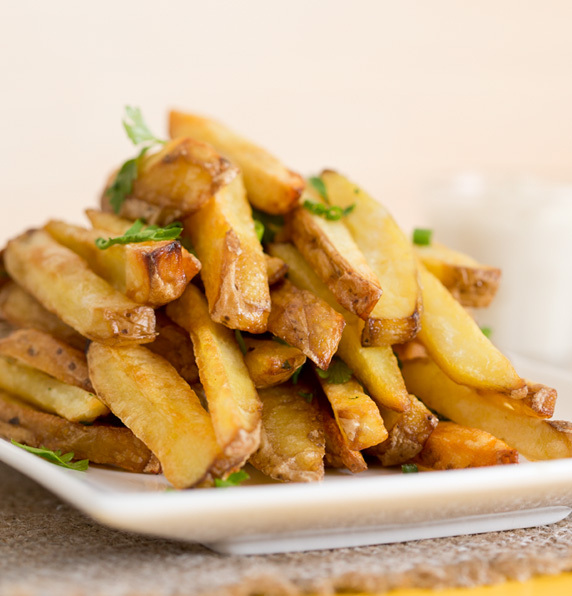 Carefully remove hot potatoes and cut into chips approximately 2cm thick. Remove tray from oven, line with baking paper and lightly brush with olive oil. Place chips cut side down taking care to spread evenly apart. Brush with olive oil and season to taste. Cook for 20 minutes or until golden brown. Devour!